原标题：In My Little Pony, what happened to Applejack’s parents? Apple family reunion: Granny smith says “all the Apples are coming.” and applejack looks out a window to see two shooting stars, at the same time and parallel and each other. The stars symbolize (the spirits of?) their parents, coming to the reunion. Stars are often used to symbolize immortality. Where The Apple Lies: Young AJ and big mac arguing about who’s going to inherit the farm from Granny, not from their parents. This implies that at this point the parents were already dead. Also, Spoiled Rich/Milk is seen here when she is much younger and diamond tiara hasn’t been born yet. Since Diamond and Applebloom are about the same age, Applebloom probably wasn’t born yet either. Cutie Mark chronicles: When little AJ leaves the farm to go to Manehattan the only ones to see her off are big mac and granny, not their parents. Everypony speaks about them in past tense. Mrs. Cake and Burnt Oak seemed hesitant to talk about them until the apple siblings brought it up, not wanting to risk opening old wounds. At the end they seem nostalgic to talk about their old friends, implying that something happened to them. The only frustrating thing about this is it leaves a big plot hole with Applebloom. She wasn’t there in any of the flashbacks, but neither were their parents, leaving the paradox that Applebloom was born after her parents died. For a while I thought she was adopted, or somehow she was actually AJ’s daughter. But Applebloom looks exactly like her father, only she has granny’s eyes. Or maybe Pear Butter died while birthing Applebloom, but that still doesn’t explain what happened to Bright Mac. Some people think that the apple parents abandoned their children, went off on an adventure and never came back, but no couple that was that in love with each other would abandon their own children just like that. 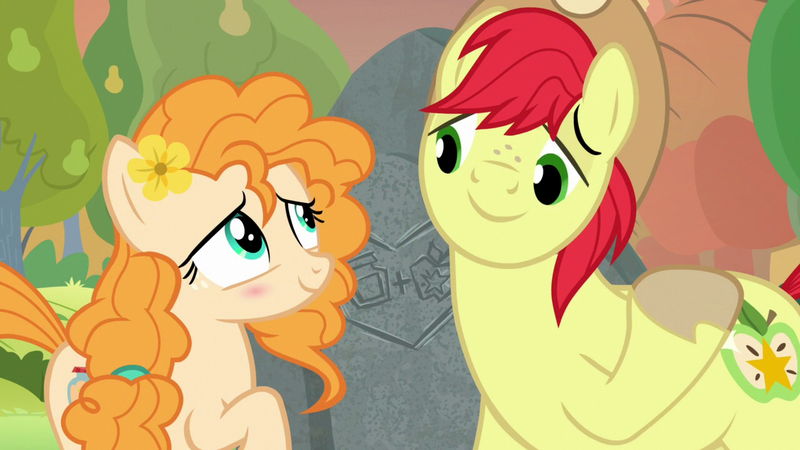 The only reasonable explanation was that they both died shortly after Applebloom was born, pear butter possibly during. It could be anything: farming accident, timberwolf/monster attack, disease, postpartum complications, etc. Basically, they’re dead, but nobody’s sure how. When the show was first created, the writers said they “never quite figured out” what happened to the parents. Lauren Faust and her team liked the close family dynamic the four apples had, and the parents weren’t really needed for an episode, so they just left it open to interpretation.